It doesn't even look like me! 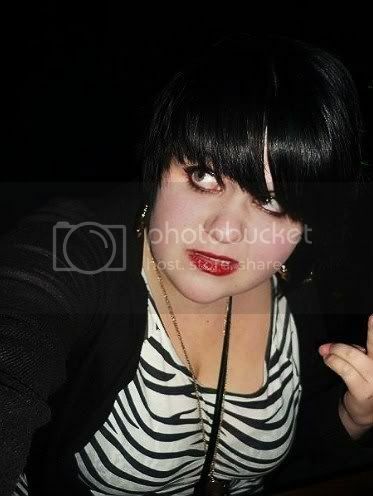 I still had fairly short hair I cut myself, that I thought was a way of saving money - really it made me look like a Kelly Osbourne/Beth Ditto wannabe! Oh, well. We live and learn. I miss my ghetto gold earrings, though! The badly applied lipstick...not so much. I used to dye my hair blue/black, which I loved - but now, for the first time since I was about 12 I'm letting my natural colour come completely through, then I'm getting blonde highlights! I'm actually planning a video pretty soon all about how my style has evolved through the years. I know I'm definately not the most fashionable girl in the world, and I've got it rather muddled throughout the years - but that's the beauty of it for me. I don't believe in fashion faux pas - I believe you should have the guts to try a style once. At least you have hilarious photos to look back on in years to come - God knows, I do! In other news my mam found me this little gem today: a cute fascinator/hairband in Asda for an amazing £1.25 in the sale! Thanks, mammy! Today was deadline day at uni, so that's mostly out of the way for now - hoorah!! Then on Saturday I'm going out on the wonderful Newcastle Gay Scene for Sarah's (of QuirkyFace) 21st birthday, which will be full of glitter, hugs and dancing with beautiful, eccentric people. I'll try to take pictures of all the fabulous outfits I know folk will be wearing. If I don't have too much fizzy pop, oh noez!! Everybody should have as many fascinators as possible. I totally agree - the head is a muchly forgotten place for accessorizing. Even if people don't suit hats, EVERYBODY can rock tiaras, hairbands and fascinators! i haven't, this is the first year i haven't gotten something - usually i do really well! i got lots in the dorothy perkins sale though including a massive cocktail ring. i dunno if it's too late now to do a post about january sales - though i suppose it IS only mid janurary! Hehe thank you very much :) I used to get the Kelly thing all the time (people even used to shout it in the street or customers at work!) but since growing my hair longer and stopping dying it black nobody's said it anymore! 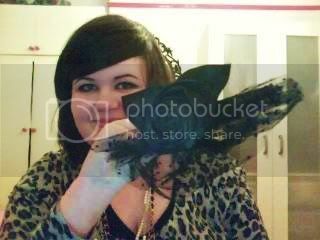 The fascinator's such a bargain isn't it?! OUTFIT POST: Sarah's Birthday Bumper Special! River Island Sale & ORANGE Is The New RED! Pink World/The Sassy Minx Interviews!